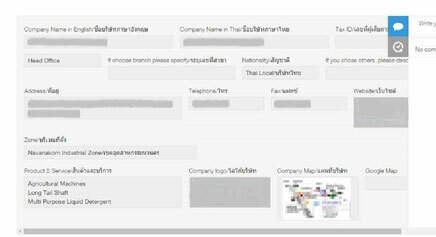 Business name: ASIAN MARUYAMA (THAILAND) CO.,LTD. kintone usage: Goods Management,Schedule management etc. Maruyama Mfg. Co., Inc began manufacturing and selling fire extinguishers in Niigata prefecture in 1895. With its core specialization in pump and engine technologies, this well-established manufacturer with over 120 years of history has business offices not only in Japan but also in Europe, the United States and many Asian countries, and its products are used worldwide. Of the many countries where Maruyama is active, it was in Thailand that the first manufacturing facility outside of Japan was launched in 2009 (Maruyama MFG (Thailand) Co., Ltd. – hereafter referred to as “Asian Maruyama”), which has since been operating as a production base for agriculture and forestry related machinery. I spoke with President Miyatake, who handles sales in Thailand as well as managing the energy-saving project utilizing high pressure pumps, and his secretary and interpreter Ms. Sintuphun. Let’s take a look at the two pillars of Asian Maruyama’s business. The first pillar is the development and sale of machinery to meet demand in the Thai market, taking advantage of the merits of the company’s own local manufacturing plant. 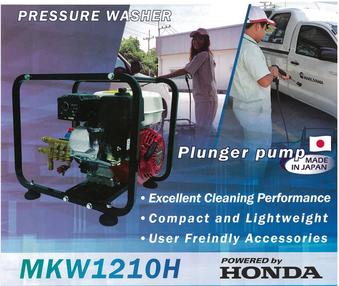 The Pressure Washer MKW1210H, which uses high-pressure water for applications such as cleaning cars and outside walls, processing of tree bark, washing of pipes, etc. was the first product to be both manufactured and sold in Thailand by Maruyama. Combining Maruyama Mfg. Co.,Inc. 's pump technology with Honda’s engine technology, the product represents a hybrid of Japanese technologies for release on the Thai market.The number of units sold has been steadily increasing, partly due to demonstration sales at exhibition events. There is also a set-up that allows for full demonstration of actual high-pressure water cleaning at such exhibitions. 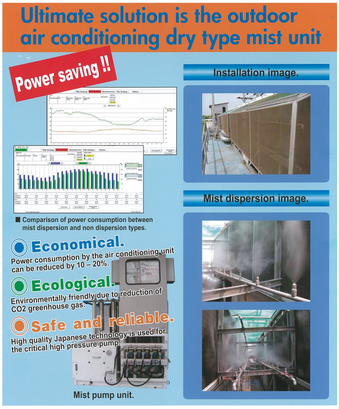 The second pillar is an energy-saving solution for air conditioner electricity consumption rates. 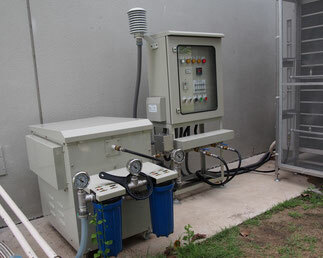 For a tropical country like Thailand, the use of air conditioning consumes a large amount of power. In other words, the cost-effectiveness of energy saving is particularly pronounced. 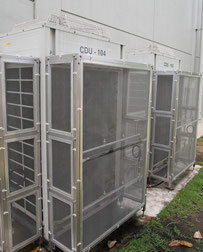 This solution lowers the temperature of the outside air taken into the air conditioner’s outdoor unit thanks to the installation of a dedicated pump unit that sprays mist and is attached to the outside of the outdoor unit.Making use of the special characteristics of Thailand’s year-round high-temperature climate, as part of the wider Maruyama group, Asian Maruyama is applying itself to the development of its own unique services. With a proven reduction in annual energy costs of between 10 and 20 percent, it is anticipated that businesses which use a lot of electricity for air-conditioning such as factories will be keen to adopt this technology. The cost-effectiveness is especially in a country like Thailand where year-round temperatures are high. Starting with Thailand and its yearly average temperature of 29 degrees Celsius, expansion of this business to neighboring countries is expected to follow. Despite keeping friendly customer support first in mind, various issues were still encountered. Sales reports were drawn up, but the management of information with a focus on the customer was not up to the task. In addition, the succession process when employees were replaced became complicated. Both to provide a high-quality of customer support, as well as to increase sales performance, it became necessary to have a centralized system for managing customer information, including the management of inquiries and a track record of putting the customer first. established company we received increasing numbers of business cards but ran into difficulties managing the data.” (President Miyatake) Based on the business cards received, a master information sheet was created for each customer and shared with the sales representatives. Everyone got to know the information from the customer visit even if they were not present. Sales representatives also shared their schedules using the calendar application. In addition, thanks to the sales representatives keeping a record of each customer’s visit, even if a sales representative was ever absent due to any reason such as sickness, the details and progress of the business negotiations are immediately clear, which has proved a great help. 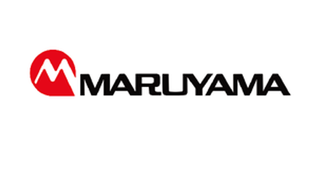 Aimingfor a "Maruyama every time" stamp of approval from customers, as a central base in Asia we will establish Maruyama as a trusted brand based on reliability and peace of mind in Thailand as well as surrounding ASEAN countries. We hope that then customers will be saying “Maruyama every time” in various different languages.